How to get your kids to clean! 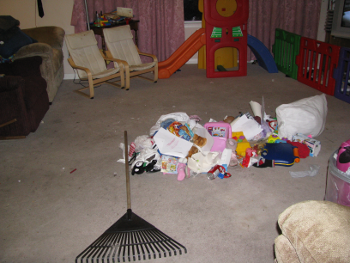 Getting kids to clean is always a battle but it is becoming less of one each time. 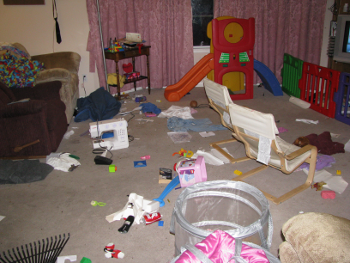 My to older kids (5 and 8) are responsible for cleaning their room, the play room and library/craft area. They must have it done by Friday morning to get their allowance so I can vacuum. The key word here is responsible. Teaching responsibility is a big part of why we started this routine. Getting them to understand that things just need to get done isn’t always easy. I used example like “I am responsible for cooking you dinner. I can’t just decide not to cook dinner just because I don’t want to.” It takes a lot of repetition but it is starting to sink in. Getting all their laundry in a basket and downstairs to the laundry room. All Stuffies on the bed or in their hammock. All Art projects on their shelves or filed. All garbage in the garbage. Floors to the point that I can vacuum. That is the final checkpoint. I also had to explain what was not acceptable, ie piling everything on the couch. While it made the floor clear enough to vacuum the coach was unusable. They can do this anyway that they want as long as on Friday morning I can vacuum. They can choose to keep it clean by doing a little bit each day. Never has happened even with all my hints. Come Wednesday night they have to clean. My wife is out Wednesdays so me and the kids clean. Seeing me clean my area reinforces the responsibility lesson. So last night they choose rooms. First choice goes to the one that I say cleaned best last week. Second choice goes to the other one and the third room is shared. My daughter cleaned her room and more than half of the shared room. My son cleaned a bit and then got distracted by a book he found. My daughter is done and can do what she like this afternoon. My son, who wanted to have a friend over is going to be cleaning instead. I also have a new Mythbusters on the PVR to offer as enticement. He will have it done for tomorrow I have confidence in that. They also get an allowance that is conditional on the Friday morning clean rule. Repetition is the key, same expectations, same rewards, same consequences. Step 1: Rake everything in to a pile. My kids at this point rush in to grab anything that might be damaged by the rake. This is mostly my one year old’s stuff. The big kids are responsible for cleaning up their own messes. Step 2: Get a garbage can, recycling bin, toy bin, lego bin and any other sorting bins needed. Sort as needed. Things like books and art projects get piled and carried to their home in one trip. 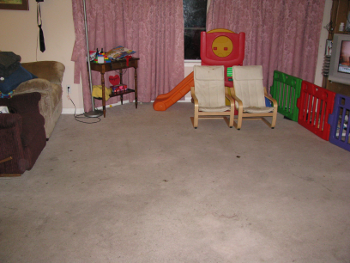 Note: Non-Stain proof carpet and kids does not mix well. Goal is to put in hardwood.